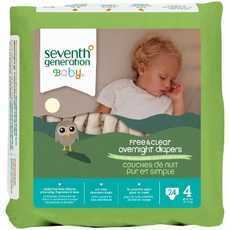 Enjoy Seventh Generation Baby Overnight Diapers Stage 4 24 Diapers. Free Of Chlorine Processing Means That The Wood Pulp Used In The Overnight Diapers Has Not Been Processed With Chemicals Containing ChlorineSeventh Generation (Note: Description is informational only. Please refer to ingredients label on product prior to use and address any health questions to your Health Professional prior to use.